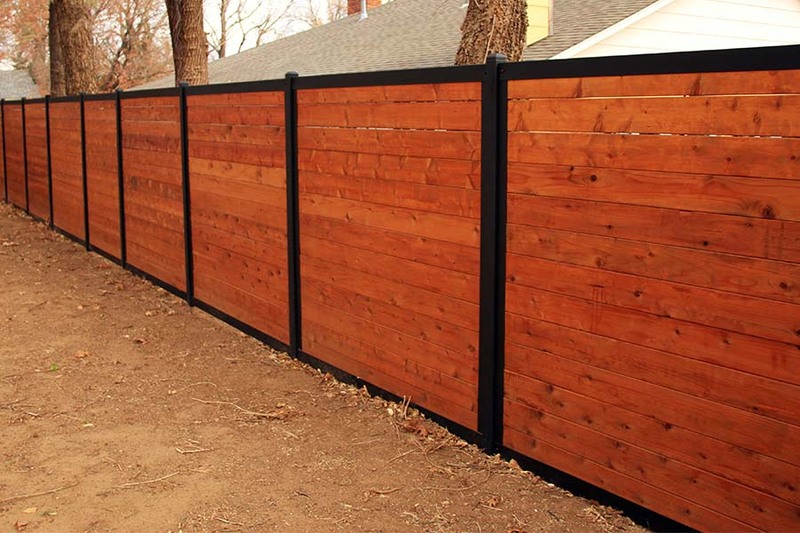 If you’re planning to build a wood fence with metal posts, you’ve made a GREAT decision. Because you’re investing in a wood fence to last for decades (instead of years). With metal posts, there is a big problem. 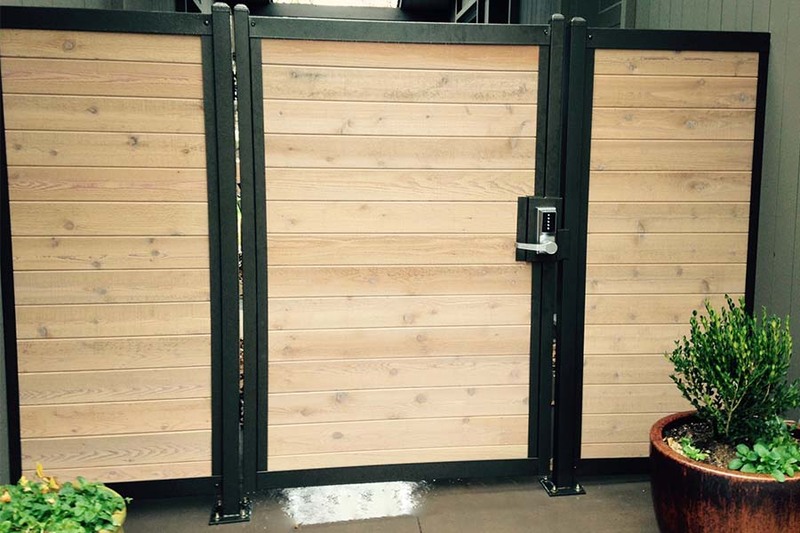 The metal posts that support your typical wood fence – are kind of (ahem) unattractive. 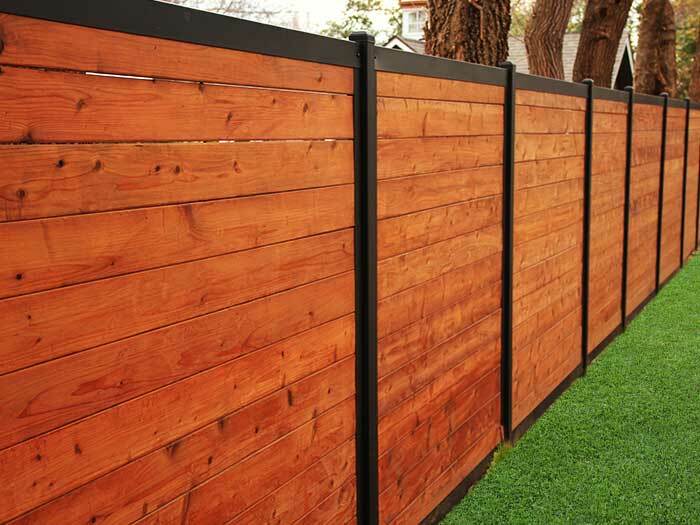 Wood fence panels slapped alongside “playground style” fence posts don’t exactly create the best look for your yard. 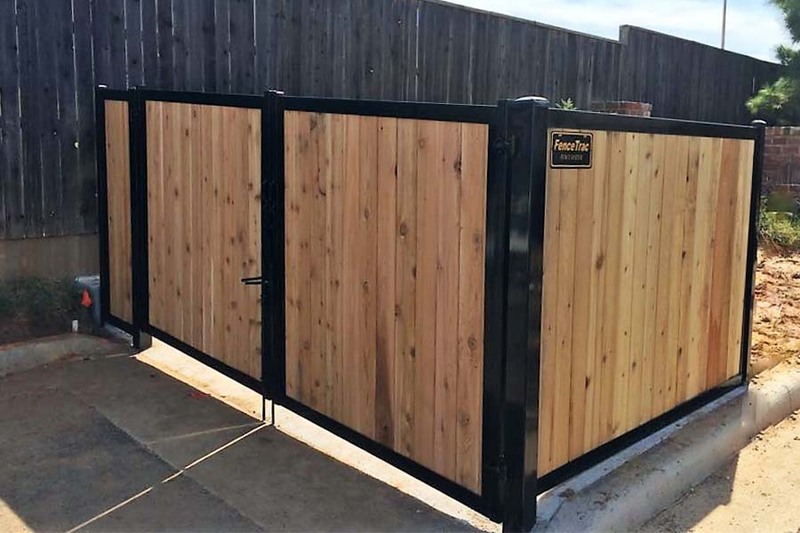 Though galvanized steel fence posts might be great for building a chain link fence, they are not so great when trying to build a beautiful wood privacy fence. There is a much better way to build a wood fence with metal posts. 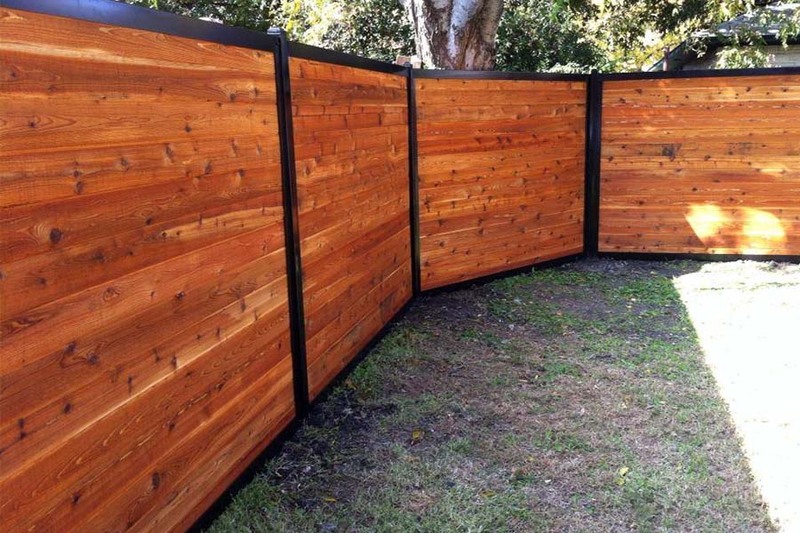 That’s completely different from your typical wood fence. 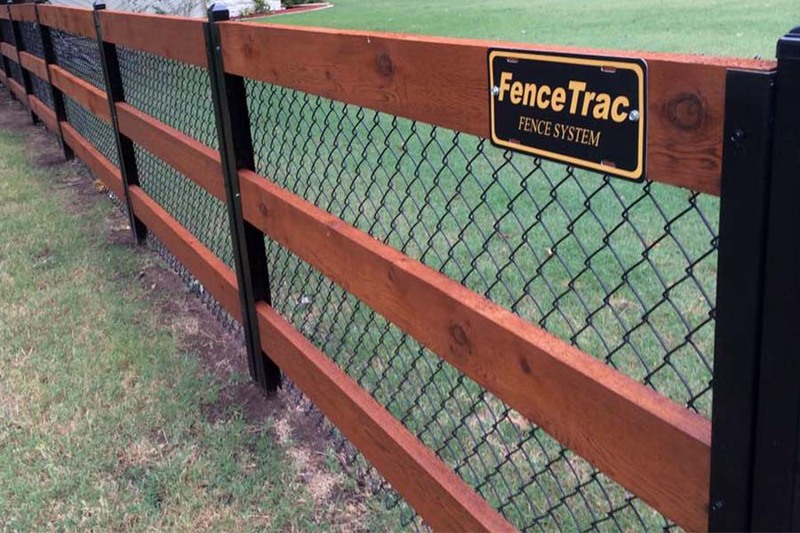 The FenceTrac rail privacy fence system has completely revolutionized what it means to build a privacy fence. 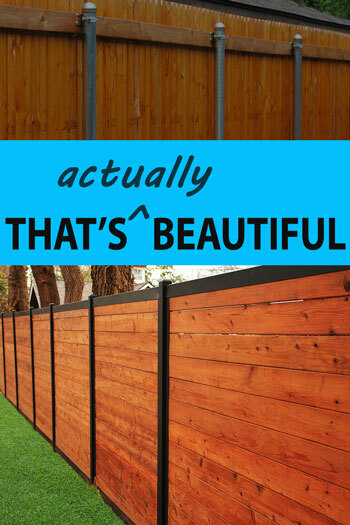 Now you can have a wood fence with metal posts that stands the test of time. And looks beautiful on both sides. In fact, a FenceTrac fence looks the SAME on both sides. FenceTrac uses a U-shaped channel rail system to hold your fence pickets in place. These fence rails are connected in line with each metal fence post, to create a fence that runs right down the middle of your posts. 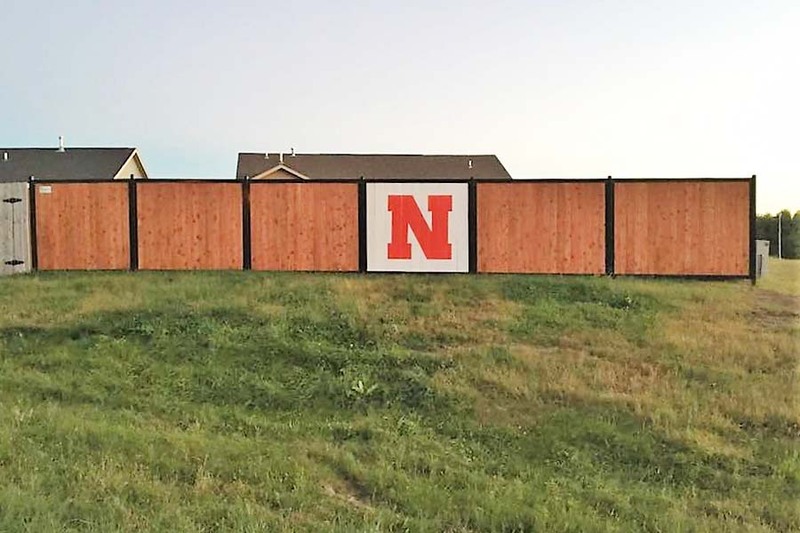 Instead of giving your neighbor the only “good-looking” side of the fence. You both see the same great-looking fence lining your property. A FenceTrac fence is beautiful, classy and looks fantastic no matter which side of the fence you’re on. Maybe you haven’t completely decided on a wood fence with metal posts. If you’re wondering why you should consider using metal posts for your wood fence, consider that the average wooden fence post rots away in 7-10 years. As soon as you put wood fence posts in the ground, moisture and wood rot begin to take a toll. Wooden fence posts aren’t made like they used to be. Prior to 2003, pressure-treated wood (including fence posts) was treated with chromated copper arsenate, a pesticide and preservative that prolonged the life of wood exposed to moisture and outside elements. The use of chromated copper arsenate in lumber treatment was banned by the EPA, because it created a potential source of arsenic exposure. Since the use arsenic was banned in the manufacture of wood fence posts, the life expectancy of your traditional wood fences declined – big time. Most wood fences meet their early demise when the wood post rots at its base. Leaving the fence vulnerable to high winds that simply blow it over. Metal fence posts provide strength to the weakest part of your fence. By using metal fence posts with your wooden fence, you will extend the life of your fence by multiple years. …Often times extending the life of your wood fence by 2X, 3X or 4X years. In this way, a FenceTrac fence is often a better investment over the long term, because it may outlast three or four all-wood fence replacements. When selecting metal fence posts for your wooden fence, you have the option of plain galvanized steel posts, painted steel posts, aluminum fence posts, and galvanized painted steel fence posts. 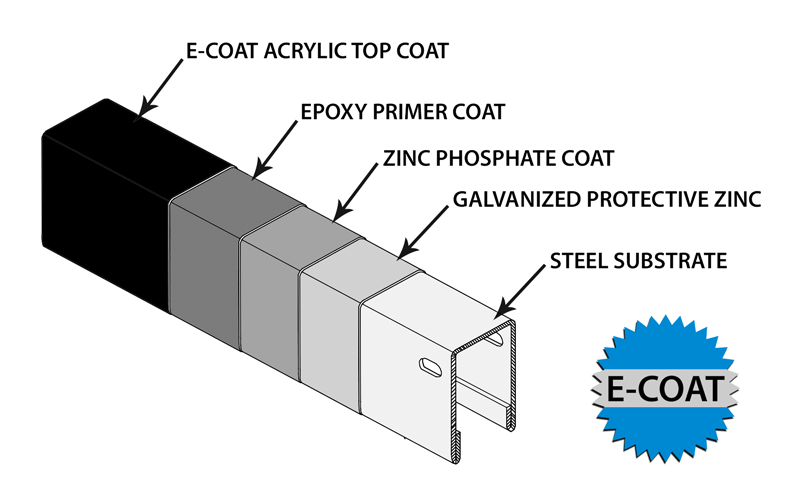 FenceTrac posts and rails are protected by a multi-step coating system on top of a galvanized protective zinc coating. That way you get the classy look of painted fence posts with the corrosion-resistance and strength of galvanized steel. When using the FenceTrac system to build a wood fence with metal posts, we recommend using tongue and groove red cedar fence pickets. This style of wooden fence picket nests together to create a strong fence with little (to zero) visibility through the fence. You can stain these wood pickets before or after installing them into your FenceTrac fence. Pickets can be installed vertically or you can easily create a horizontal wood fence with metal posts using the FenceTrac rail system. 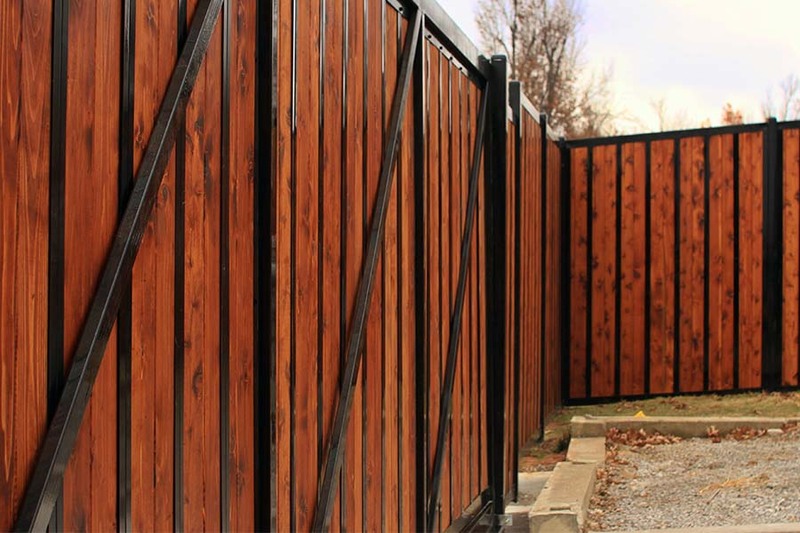 Just check out our extensive gallery of fence installations to see examples of horizontal wood privacy fences. And with FenceTrac, there are no fence backer boards. You simply cut the pickets to length and slide them into the rail system. Four bolts hold the horizontal and vertical rails together to create each fence panel. The vertical rails act as metal post adapters, securing each fence panel to the metal posts. 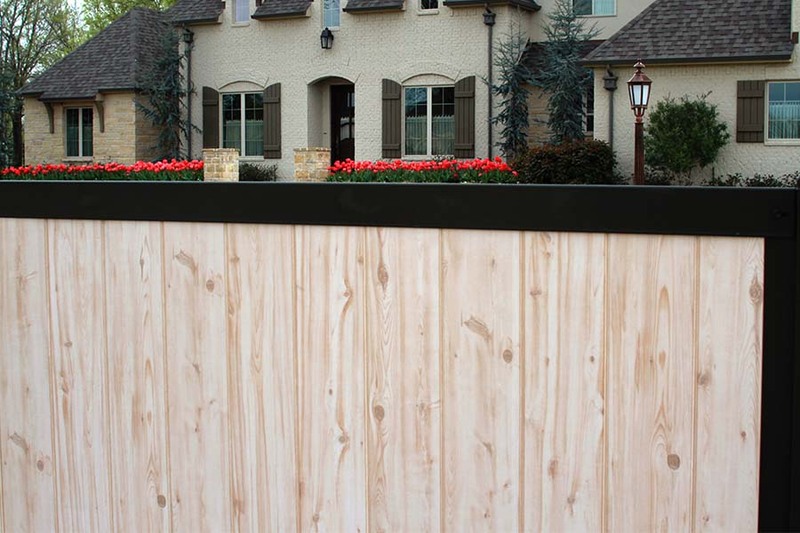 With FenceTrac, you are not limited to the same-old look of a wooden privacy fence. So you can have the look you want. In addition to wood pickets, you can use nearly any type of fence infill material you want. We’ve seen FenceTrac combined with bamboo, metal panels, welded wire, vinyl planks, PVC, composite fence planks and more. You have complete freedom to create a fence that fits the style and functionality that you need. 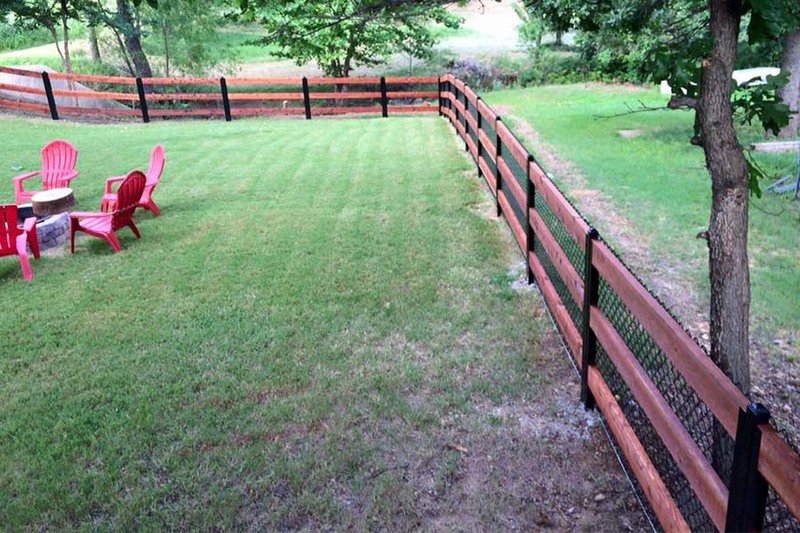 Here is a small sampling of residential and commercial fence projects using FenceTrac. As you can see – with FenceTrac – the possibilities are endless in terms of fence design, fence style, and fence layout options. 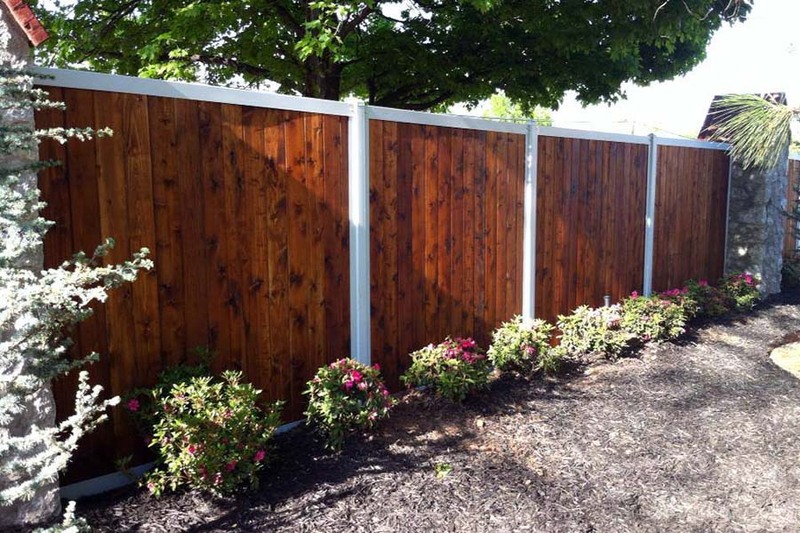 You can build a durable, long-lasting wood privacy fence, incorporating either a vertical picket or horizontal picket look. Or you can build a privacy fence with some other type of infill. View more privacy fence ideas. Fence color options include: black, white, tan, and green. And we also offer swinging gates or rolling metal frame gate kits (with latches, hinges, hardware, etc.) to match the style of your FenceTrac fence. 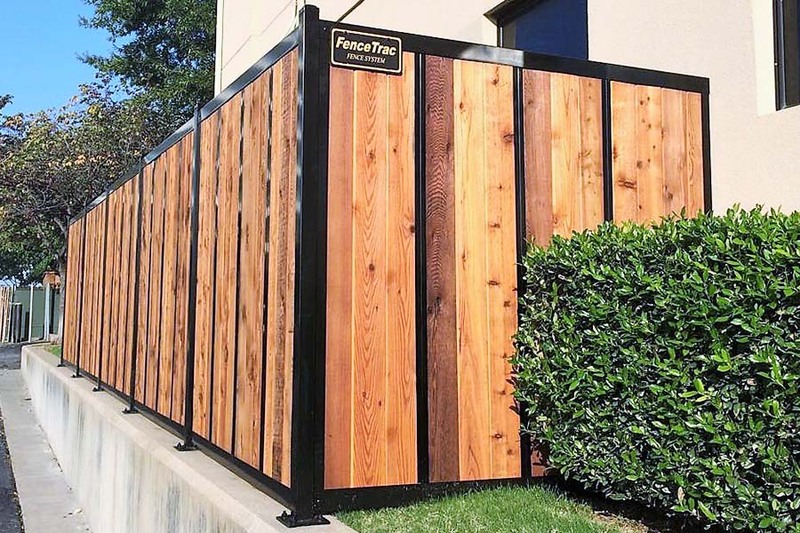 Whether you operate a professional local fence company or want to build it yourself, the FenceTrac system makes it easy to install a more beautiful wood fence with metal posts. Contact us for a free quote or for more information.